We have an eclectic selection of vacation homes, cabins and townhomes from Duluth to the Canadian border including Lake Superior and inland lakes. Always Grace is a uniquely beautiful home on the shores of Lake Superior near Grand Marais, MN. Anchor Point is a Luxury 5-Bedroom Located on the Shores of Lake Superior. Aspenwood 6520 is a spacious vacation townhome rental in Tofte with stunning Lake Superior views from private decks. 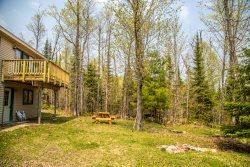 Aspenwood 6526 is a cheerful 3 bedroom family vacation townhome in Tofte with panoramic views of Lake Superior. Aspenwood 6536 is a spacious vacation townhome rental in Tofte with stunning Lake Superior views from private decks. Aspenwood 6538 is a luxury 3 story Tofte vacation townhome rental with amazing Lake Superior views and plenty of shoreline. Aspenwood 6544 is a spacious 3 level Tofte townhome with awe inspiring views of Lake Superior. Bay Breeze is a beautiful Hovland vacation home rental along the shoreline of Lake Superior that is the modern version of warm and cozy. Birch Hollow is a cozy vacation rental home along the shores of Devil Track Lake in Grand Marais. Birken Bay is a geodesic dome home vacation rental on the shores of Lake Superior in Schroeder, MN.